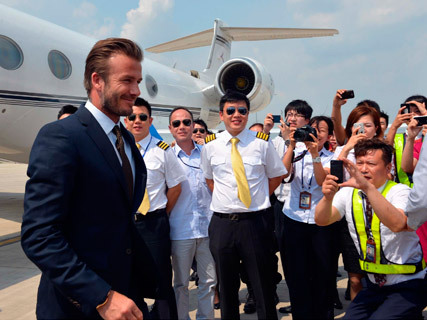 David Beckham touched down in China to begin his latest footballing role earlier this week… and it seems fans were a little pleased to see him. The smouldering sports star was greeted by hoards of people as he arrived in Beijing, for a tour in his new capacity as ambassador to the Chinese Super League. Excitement reached fever pitch as Beckham arrived in the city, stepping off a private jet at the airport, in jeans, a t-shirt and his trademark beanie hat. Despite soaring temperatures, Mr B looked as cool as a cucumber as he signed autographs for fans who had camped out for hours to see him. Taking to Facebook to keep fans up to date on his movements, Becks posted a series of photos of his trip, including one of a build up of traffic, captioned: ‘Love Beijing, although not this traffic jam. Had a good day so far’. 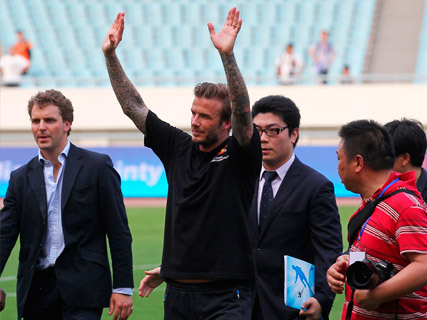 From there, Beckham travelled onwards to Nanjing, where he visited football club Nanjing Sainty FC. It’s thought David Beckham’s latest post will include attending football matches and visiting clubs to help promote the game to children. This comes after the Chinese football league was dogged by a match fixing scandal last year. It’s thought Mr B’s visit will including training sessions with local children and visits to football clubs in Beijing, Qingdao and Wuhan.